Sound Percussion is an exciting and revolutionary method for individual or group instruction. The curriculum is divided into six main sections: Sound Rhythms, Sound Meter, Sound Rudiments, Sound Rolls, Sound Effects, and Sound Performance. Each main section contains an introduction called Sound Concepts, a series of exercises called Sound Reinforcement, and a section called Sound Combination which is geared towards practical application. The books are usable in any combination, with a flexible structure that allows for working progressively or jumping from section to section as needed. Students will gain confidence and become more well rounded. 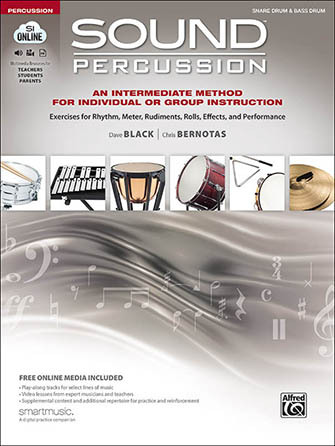 Teachers will have a complete resource for percussion classes and ensembles. A vital addition to your program!